I admit I had to look her up. I don't think I've seen any of those productions in which she has appeared, except maybe Nip/Tuck, if it was the 2009 season I watched. I don't recall. But all that matters is that a lot of people love her and she recently visited Desert Hot Springs (maybe she's still here). "Desert hot springs with my spiritual brother"
On Facebook she shared a montage of scenes from her trip, including several more of the spa where she stayed, but here's the best shot of all (IYAM - if you ask me). click for the whole montage. Daniel Kowalski of LaGrange, Illinois, a far northern suburb of Albuquerque. The Dinah Shore estate in the Las Palmas neighborhood has sold for $5,230,000 to Leonardo DiCaprio. The 1.34 acre estate, in the heart of the fabled and celebrity-pedigreed Old Las Palmas 'hood, was custom designed as a series of glass-walled pavilions and built in the mid-1960s for the late and legendary singer/actress Dinah Shore by prominent mid-century modern architect Donald Wexler, now in his late 80s, who in his professional heyday plied his trade predominantly in and around the Palm Springs area. She adds that all parties were required to sign confidentiality agreements. Get out your check book, it's only $395,000. Here it is in Streetview, a photo that was appropriately taken at sunset. There is an Emmy category called "Inexpensive Small Rugged HD Camcorders." What a surprise, GoPro won it this year. They say that in 2009, before they offered HD, their biggest retailer was a Pep Boys store not far from Universal Studios. That's how they learned the film industry was already beginning to incorporate GoPros into some of their photography. Acceptance ceremony shot with (duh!) GoPro cameras. At 1:23 you can hear a series of beeps indicating some nearby GoPro shut down either because its card filled up or its battery ran out. Here's a GoPro photo of the GoPro crew. An article that focuses on Netflix's plans for 4K streaming and talks to a few other people about picture quality, high-dynamic range, greater bit depth - IOW, better color and contrast along with higher resolution. 4K movies will not fit on Blu-ray, and Neil Hunt, Chief Product Officer at Netflix, predicts that Blu-ray is the end of the line for plastic discs. 4K will be streamed. Period. Breaking Bad will be streamed in 4K later this year. The next season of House Of Cards will stream in 4K. Netflix could ship you 4K movies on a hard drive, but I guess they won't go that far. This one is for the second season. VP9 is, like H.264, a video codec. But VP9 comes from Google and is royalty-free. Apple Insider explains it. The plan is to use it to stream 4K videos to YouTube with less bandwidth than H.265 would require. Bringing us to this YouTube video of Kauai which will be used as one of the demonstration videos next week at CES. It's a good video even though you can't actually see it in 4K yet. Although no GoPros were used in the photography, you do get to see a GoPro in use, so that makes this okay. Still photos that were being shot by another photographer along on this trip can be seen here. The Rude Pundit (one of my guilty pleasures) admits that one of his guilty pleasures is Restaurant Impossible and then he goes on to write about an episode "last week" (which I missed) that focused on the Georgia Boy Cafe in Maryland that is owned by two gay African-American men who have been together for some years. Rude Pundit liked the way they were presented on the show: "A damn food show was more honest and less sensationalistic and patronizing about how a nonwhite LGBT couple exists than pretty much anything the Rude Pundit's seen on American television." Getting Married In Southern California? A Major Cable Network is currently casting eccentric, dynamic brides with dreams of having an over the top wedding. If you're a bride seeking a blingy, flashy, glitzy wedding and want your big day to mimic a Greek, Italian, Persian or Gypsy type of affair, then you are our bride!!!! Let us help to enhance your big day and document it on television for you and your honey to remember for a lifetime! Deadline to apply is Monday, November 25th 2013. - Must be getting married between now & Valentines' Day 2014 in the Greater Los Angeles area / Southern California. Send an email to RebeccaCasting@gmail.com with your Name, Phone Number, Photo of the engaged couple, and tell us about a little bit about yourselves! Hopkins to Cranston: "Your performance as Walter White was the best acting I have seen – ever." Anthony Hopkins praises Bryan Cranston and everybody at Breaking Bad. What is extraordinary, is the sheer power of everyone in the entire production. What was it? Five or six years in the making? How the producers (yourself being one of them), the writers, directors, cinematographers…. every department – casting etc. managed to keep the discipline and control from beginning to the end is (that over used word) awesome. 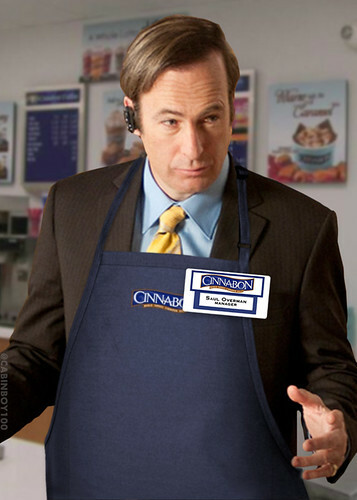 Cinnabon stores in Omaha are using Breaking Bad imagery to promote themselves. They say "corporate" has approved this, so we must assume that Cinnabon has agreed to pay AMC a ton of bucks. And that customer is Fox News. They've installed 55-inch Windows touchscreen tablets for their staff to work on in the background. I'm sure there's a betting pool where people are trying to guess when all the tablets will enjoy a simultaneous BSOD. I'm glad to see that efficiency is top priority for them. Having given their staff a huge amount of display real estate, rather than filling it up with more data they're just enlarging the fonts and photos so they can be read clearly from 20 feet away. I am disappointed that they are sticking with traditional keyboards, circa 1990 style. Not that those aren't excellent keyboards, but an on-screen keyboard spread across that big screen would have helped their workers develop some big shoulders...or new sorts of repetitive motion injuries. UPDATE: Another reader has pointed out that the staff still have big, standard telephones. Why not something super-Skypey on those tablets? Addresses of 20 locations from Breaking Bad. Have You Felt Left Out Of The "Breaking Bad" Loop? If so, then AMC has the solution for you. From Wednesday (Sept. 25) at 8 PM until late Friday (Sept. 27) AMC will be running a "Breaking Bad" marathon of Seasons 1 through 4. You will, of course, need either a DVR or supplemental medication to watch the whole marathon. And then, just when you think you are almost recovered, a marathon replay of Season 5 will commence on Saturday (Sept. 28) at 11 PM. That will run continuously until the grand finale broadcasts at 9 PM on Sunday. There's a lot of other meta stuff scheduled around it. Read the linked press release for info.